The Asia-Memphis Express is an all-in-one less-than-containerload (LCL) import service direct from points in China to destinations throughout Tennessee and surrounding states. With weekly sailings from major ports in China, we deliver a reliable service that you can set your watch to and is up to 10 days faster than traditional import services. 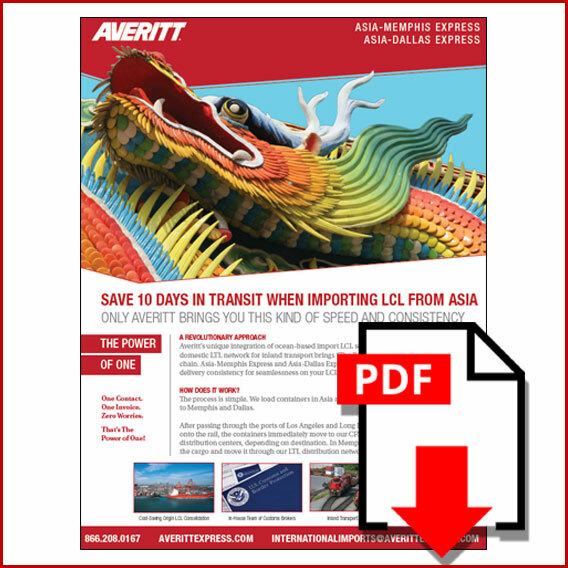 The Asia-Dallas Express integrates Ocean, rail, and LTL transportation to provide shippers in Texas and surrounding states with an all-in-one direct LCL import service. From consolidation points in Central China, cargo moves via vessel and immediately transits through the Ports of Long Beach and Los Angeles and then moves intact in the ocean container via rail direct to Averitt's bonded CFS service center in Dallas. From there, the cargo is deconsolidated and distributed through Averitt's LTL network to the importer's facility or direct to the final consumer.